The secret is a proprietary component inside the filter"an exclusive porous tube that water must pass through before re entering your pool. It creates a final barrier to the small particles sand cannot stop, including the finest dust particles, algae and pollens. The result is a level of water clarity never before possible. At the same time, Sand Dollar is incredibly simple to operate and maintain, and its built with long term reliability in mind. Stunning performance. Supreme simplicity. Superior value. Pool filter operation doesnt come any easier. The Sand Dollar® sand filter features a multi-port valve that puts all filter functions right at your fingertips"just rotate the handle to the desired position and Sand Dollar does the rest for sure and simple operation. One-piece thermoplastic tank for exceptional strength, corrosion resistance and long life. Attractive almond color blends with any outdoor dcor. 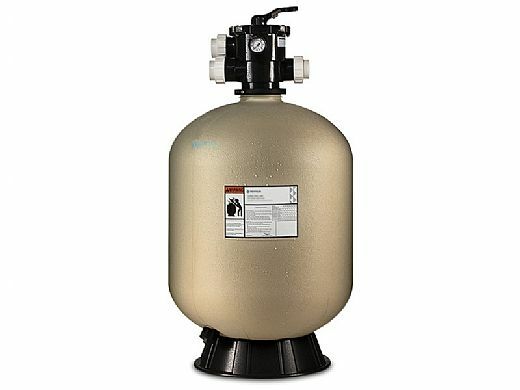 Does this filter ship with the 2” hybrid valve? The image shows the 2” hybrid valve, but if you click on the “parts available” link the exploded view shows the Tagelus valve and the parts list calls out both. I need the 2” hybrid valve to match my plumbing.